Guatemalan President announces his country will move its embassy to Jerusalem two days after the United States. 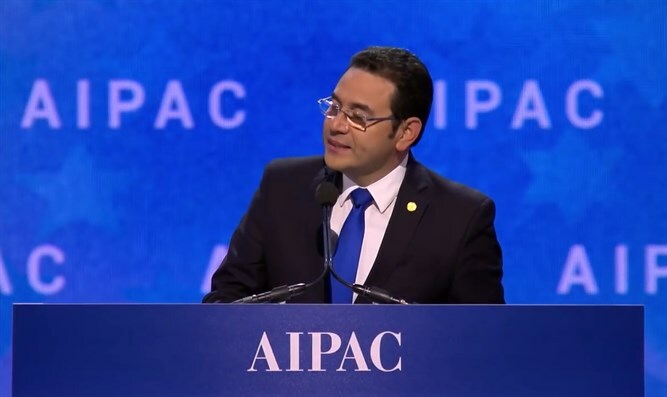 Guatemalan President Jimmy Morales confirmed on Sunday night that his country will move its embassy in Israel to Jerusalem on May 16, two days after the United States moves its embassy to the Israeli capital. His announcement came at a speech at the AIPAC Policy Conference in Washington. “On December 24 of last year, Guatemala was the first country to join the United States and announce that we will be returning our embassy to Jerusalem. I would like to thank President Donald Trump for leading the way,” said Morales. “I decided to return the Guatemalan embassy to Jerusalem. As a sovereign decision, we recognize Jerusalem as the capital of Israel,” he added. Earlier on Sunday, Morales met Prime Minister Binyamin Netanyahu, who told him, "Thank you for everything you're doing, for recognizing Jerusalem as Israel's capital. I hope soon you will move your embassy to Jerusalem; we hope." Morales replied, "It is an honor and it is the right thing to do." On Saturday, Guatemala's Constitutional Court rejected a local lawyer's attempt to prevent the government from moving its embassy in Israel to Jerusalem. A court spokesman said the high court's five magistrates turned down a request from lawyer Marco Vinicio Mejia, who argued in a petition filed in January that the embassy move was contrary to international law.